Lase Med Inc: Disinfo Warning. Bringing provocateurs and disinformants into focus with facts and evidence. Michelle Wolven: Agent-Provocateur, Snake-Oil Peddler, Disinformant, Stalker. I've been a guest on Dr. Antonella Carpenter's radio program, The Medical Conspiracy, on three separate occasions. 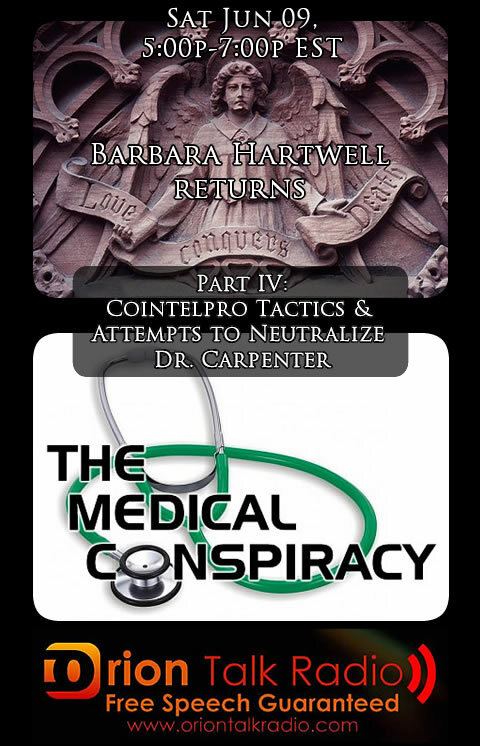 I was first invited on the show by Dr. Carpenter after she heard me talking about COINTELPRO on Against the Wall (Orion Talk Radio) hosted by James Freeland. This evening I will be back on the program (5-7 PM Eastern Time) to continue our discussion on the neutralization campaign against Dr. Carpenter. After doing my own research on Lase Med Inc., and after having spent hours in conversations (off the air) with Dr. Carpenter and her professional associate, Randy Simmons, I have come to regard them not only as high-profile Targets of a sinister and far-reaching counterintelligence operation, but also as personal friends. Shut down by a corrupt government. An organized blogging team is following Dr. Carpenter, as they have been doing on search engines since 2010. Barbara Hartwell & Lase Med Inc.